Camp Market is a small USAG-Yongsan installation located in Bupyeong, about halfway between Yongsan Garrison and the Port of Incheon about 30 miles to the west. It is home to the Defense Reutilization and Marketing Office, the Army and Air Force Exchange Service distribution and a bakery which provides bread, pastries and other baked goods to installations throughout the Republic of Korea. The installation has 34 warehouses with a combined total of 852,495 square feet of storage space. Most of the installation's 600 employees are Korean National employees, Korea Service Corps workers or contractors. Camp Market was home to the Kimpo Postal Detachment, Defense Reutilization and Marketing Office, Printing and Publications Command - Korea, AAFES Bakery, and the AAFES Distribution Center. Camp Market was located to the west, half way between the Capital City of Seoul and the historical port of Inchon, between Kimpo Airport and Incheon. Incheon is where the Wolmido Islands guided General McArthur into port during the Incheon Invasion. They subsequently guided tourists through a maze of amusement parks, museums, and seaside restaurants. A small plaque stands where McArthur first stepped ashore. Directly behind it stands a "Ninja Turtle Amusement Ride" where children's smiles shine in testament to the success of the invasion. In the opposite direction, Seoul awaits only 45 minutes by train. Depot Support Activity Far East (DSAFE) had 2 large warehouse and fielding complexes, one at Camp Market and one at the port in Pusan. Camp Market was in the vicinity of Inchon and was a staging area and breakbulk point for units stationed along the demilitarized zone. In Pusan, DSAFE served as a receiving area for items shipped in by sea and as the supply point for depot-level contractors. DSAFE's Camp Market operation had secure facilities for weapons and sensitive items. Operations at both Pusan and Camp Market included administrative support personnel, 2 22,500-square-foot warehouses, 100,000 square feet of fenced-in, open storage, complete motor pools, office space for fielding teams, classrooms for new equipment training, and e-mail and datafax access. After the Gulf War, AMC, and CECOM in particular increased its reliance on contractor support for sophisticated communications-electronics and weapon systems. CECOM had deployed numerous contractors and Army civilian personnel to ensure continuous sustainment support. What was needed was some way of managing these multiple service sources. The solution was a structure that would join all of these service providers into a single, cohesive support entity. The ESSC's provided that structure on a regional basis by acting as an umbrella for all service providers. The "umbrella" was the ESSC staff. A CECOM civilian at each of 4 regional facilities coordinated these efforts and was backed up by a management cell at Fort Monmouth. The 4 ESSC's were located at Fort Bragg, North Carolina; Fort Hood, Texas; Friedrichsfeld, Germany; and Camp Market, Korea. These 4 centers provided support that was diverse enough to support six Intelligence Electronic Warfare Regional Support Centers (IEW RSC's). The Camp Market complex had its beginnings in the mid-1930s when the Japanese built a large supply depot and arsenal at Bupyong-Dong, Inchon City, to support their troops in Manchuria. Most of the permanent buildings date from that year. 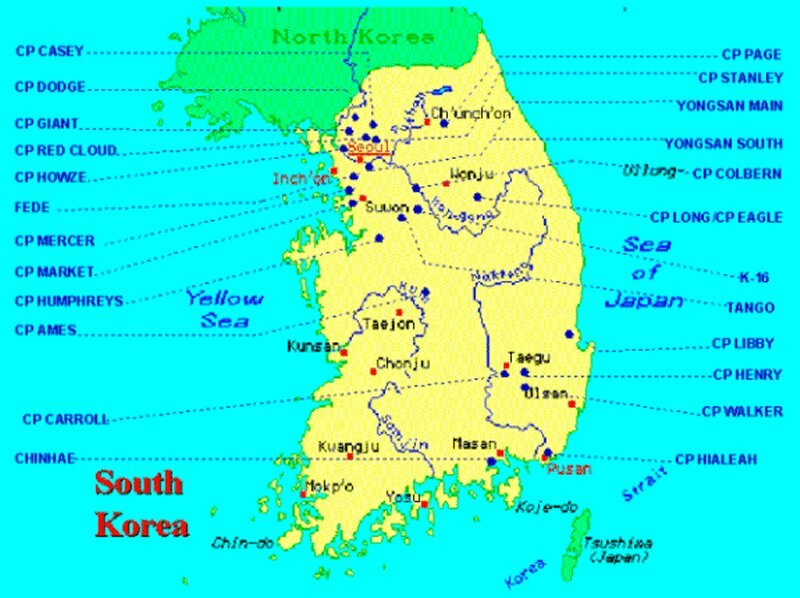 In 1945, after the Japanese surrendered to end World War II, the Army Support Command Korea was established at the former Japanese depot. It was at this time that the area of Camp Grant, Camp Market, Camp Tyler and Camp Hayes acquired the acronym ASCOM. In July, 1950, the invading North Korean Army overran the area and, from then until 1951, ASCOM changed hands several times as fighting swept up and down the peninsula. In the spring of 1951, United Nations Command Forces retook the area permanently. The US Marine Support Command for Korea and the Inchon Replacement Center were the first major tenants at ASCOM after the Korean War. Because there were no other major depots in the northern area of the Republic and the transportation network between this area and Pusan on the southeast coast was very limited at that time, stockpiling of supplies and equipment and the expansion of a tremendous logistical complex at ASCOM were inevitable. In 1963, there were 7 US Army technical depots located in the ASCOM area. That year they were consolidated into one general depot designated as the 8th US Army Depot. In 1964, other depots were established in Korea and the organization was redesignated the US Army ASCOM Depot. Administrative and post operations were handled by the ASCOM Area Command and subsequently the 20th Support Group. In 1972, the phase down of US Army operations at ASCOM was begun as part of an on-going program to consolidate 8th Army support activities on a functionalized area basis. Missile and aviation support operations were established primarily around Camp Humphreys while depot and heavier maintenance support activities were located at Camp Carroll near Waegwan. The ASCOM Storage Facility ended its operations on 31 January 1973. Once the most active operation of its kind when it was called the US Army ASCOM Depot, the unit in latter years had become a sub-command of the Camp Carroll Depot at Waegqan. Other major US army units at ASCOM that were involved in relocation included the 69th Transportation Battalion, 30th Ordnance Company, 595th Maintenance Company, 121st Evacuation Hospital; and the 199th Personnel Service Company. Most of the ASCOM complex was turned over to the Republic of Korea Ministry of National Defense on 30 June 1973, when the 20th General Support Group terminated its operations there. As part of the consolidation of US elements in Korea Camp Market was integrated into the expanded responsibilities of US Army Garrison Yongsan. 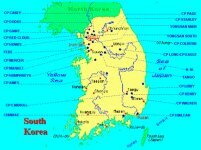 Also, as part of the US-ROK Land Partnership Plan developed in 2002, the Kimpo Mail Facility was transfered to the Republic of Korea in 2005.